Pieces of BGSU» Blog Archive » How do you celebrate your Valentine’s Day at BGSU? How do you celebrate your Valentine’s Day at BGSU? Valentine’s Day is right around the corner which means it is either going to be the best or worst weekend ever for students at BGSU. Whether you have a significant other or not, there are plenty of ways to celebrate your Valentine’s (or anti-Valentine’s) Day at BGSU! Being tight on money is all a part of the college experience but that doesn’t have to get in your way for Valentine’s Day. You can have a Netflix movie night in your dorm room or apartment with your significant other and order a heart shaped pizza from Papa Johns. Use up your swipes and have a date at The Oaks followed by Pinkberry for dessert, you will miss meal plan once it’s gone, trust me. 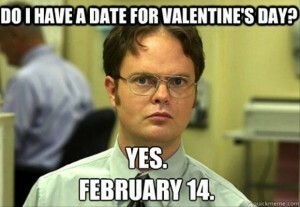 If you are single, happy anti-Valentine’s Day! Grab your closest group of friends and go celebrate Carillon Place’s Anti-Valentine’s Day meal starting at 4pm. Order Cookie Jar and write a special note on the box to tell yourself how awesome you are. Valentine’s Day doesn’t have to be all about spending time with your romantic partner; spend it with those you love whether that is your girlfriends, the boys, or your goldfish that lives in your dorm room! Many other college students, including myself, are in long distance relationships which can make holidays like Valentine’s Day more difficult. This is where delivery and snail mail come into play. Call Jimmy John’s and send your special someone a Turkey Tom with a cheesy note on the bag and then Facetime them right before it arrives. Send them a 99 cent Hallmark card with a printed out picture that you had taken weeks before together. Little things go a long way in long distance relationships, as well as in any relationship!